We have teamed up with Miler Genuine Draft and Mixcloud to offer one lucky DJ the chance to play at the Top 100 DJs Party in Las Vegas this summer. Prepare for your SoundClash entry with three essential tips to see you on your way towards rocking the Las Vegas dancefloor. If you play a genre that could be defined as melodic (deep house, trance, progressive) then the idea of harmonic mixing should be on your radar. Essentially this boils down to playing consecutive tracks that are either in the same or a complimentary musical key. This can be done by ear, and many DJs will do a form of harmonic mixing on instinct. However for those who want to remove the human error, there are many tools that can help you to this. Mixed in Key is the best know software as it will detect the key in all of your existing digital collection. 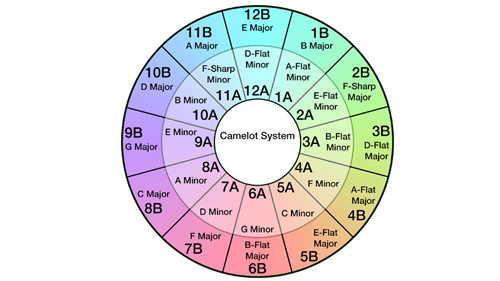 It is also the easiest to use due to the Camelot scheme - which uses the wheel diagram below - in which each consecutive number will be a harmonic key change. Bonus tip: Jump two places forward or back on the Camelot wheel to get a transpose effect that is jarring to the dance floor but when done correctly has an uplifting effect. One of the most common tricks used by top DJs - second only to the ubiquitous filter sweep - is the delay-induced drum roll. You can create an effect that sounds like a small drum roll to build tension and excitement on the dancefloor, by simply tweaking the delay within your effects processor. All mixers and DJ software are set up differently but you will need to set the delay time to 1/2 and engage the effect with the dry/wet control completely closed. As you approach the end of the phrase that you would like to create some drama in, quickly twist the dry/wet to around 11am - leave it open for 2–4 beats and then slam the rotary back to the left as the beat drops back in. This is a great tip for using during groove tracks, when you need to create some drama on the floor. Bonus tip: Try combining this with the high-pass filter or low frequency EQ to add variation to the effect. Many DJs are stuck in their ways when it comes to the techniques they use for the fundamental part of DJing - the transition between tracks. Most pros use the channel faders due to the control they offer, however the Crossfader is a tool that should not be ignored. You can use the two together for ultimate flexibility. Keep the crossfader curve set to the sharpest cut-in setting and leave it in the central position. You can then use the channel faders without any drop in volume, but if you have a vocal phrase or fill on one channel you can quickly cut the fader quickly to one side, before dropping back into your mix, with the channel faders at the same position. Bonus tip: If you mix using Pioneer equipment, you can utilise the Fader Start feature to cut in vocal snippets or samples using just the crossfader to trigger the CDJ, leaving your second hand free for tweaking the effects. Submit your Miller Genuine Draft SoundClash entry here.